Three deep in every position but with three players double jobbing, so 42 players total. It's no wonder Ireland were playing in blue last saturday. Great to see Fergus McFadden featuring but why is he covering only one position? Fergus can play anywhere. Jetstream wrote: Great to see Fergus McFadden featuring but why is he covering only one position? Fergus can play anywhere. 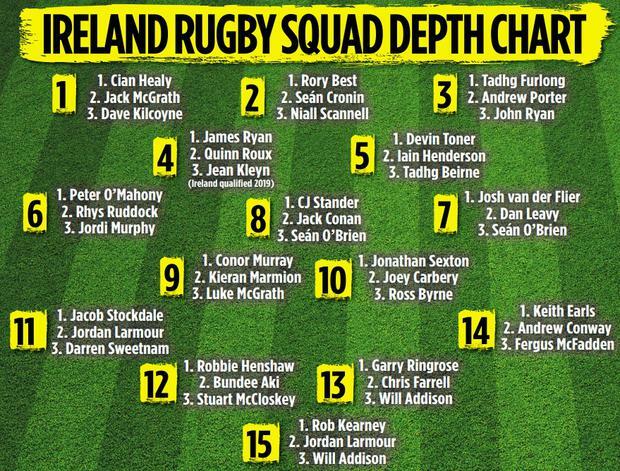 Depth in irish rugby is clearly better than before and the strongest that i can remember. Carberry and Byrne COULD become decent 10’s (i think Byrne could turn out to be pretty good in a couple of years) but the fitness of Jonny Sextn is absolutely key to Ireland. Not only is he a top class player but there is no-one else who has consistently delivered at 10 at eurooean or international level. With Sexton playing as well as he is I am sure he would have been Ireland’s first choice 10, but from an ireland point of view, having another 2 years of paddy jackson’s development for the world cup and pushing Sexton would have been ideal. Carbery and Byrne are the next best options but neither has the experience nor quality (at least yet) at 10 that PJ has. Losing Sexton would be a big blow to Ireland regardless butat least with PJ there it would have softened it to some extent. Carbery will get a lot of heineken cup time over the next 2 months plus a couple of derbies. Then it's up to Joe to give him some decent time in the 6N including as a starter in the Italy game, maybe? Dave wrote: Must be a pisstake? Finding the depth chart hard to fathom? Pity someone wouldn’t deliver a depth charge to the FIRFUCs instead. There is a lot of Rugby between now and the World Cup and the near certainty that at least 3 will pick up a reasonably serious injury . And much as the press (southern ) love Carberry there are a number of factors which put ?s at the depth chart as written . Firstly the World Cup squad is limited in number and therefore selection is based on the need for a23 selection rather than position only . Secondly Joe because of the depth is unlikely to follow the example of previous coaches and expect the core of his squad to play in every game . Thus in his selection may include a couple utility players . not be selected on that basis but as a centre . With his versatility, the return of Fergus McFadden from injury can't come soon enough. Dublin4 wrote: With his versatility, the return of Fergus McFadden from injury can't come soon enough.